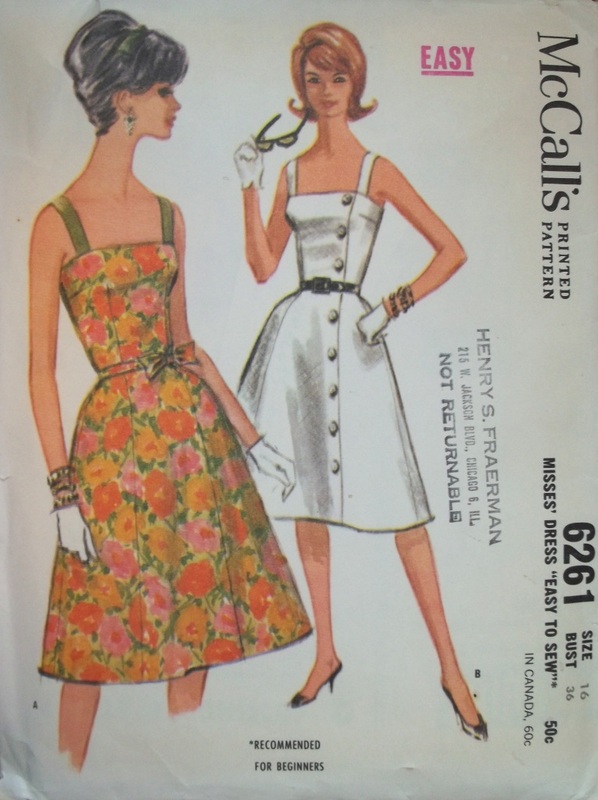 Out of all the fashions, styles, and decades of clothing which I sew, I can only go for so long before the need to make something from the 1960’s makes itself manifest. I do love making and wearing the 1960’s style, and am always so impressed with the patterns and clothes I make with patterns from that decade. Personally, in those patterns I find the styling lines so interesting to the point of impressive and notice the fit from the 60’s to be either difficult or spot on. This unique sundress is one of the best examples of a 60’s – a superbly complimentary fit combined with an unexpectedly rich floral print. This is by far my favorite make for this years’ summer. FABRIC: a 100% cotton, bought from the quilting section of Hancock Fabrics. The cotton print had the label “Eclectic Elements by Tim Holtz – 2014 Bouquet“ on the selvedge. It is a multi-layered, off-inked mix of flowers – roses, hydrangeas, lilacs, and peonies – in soft but strong colors. 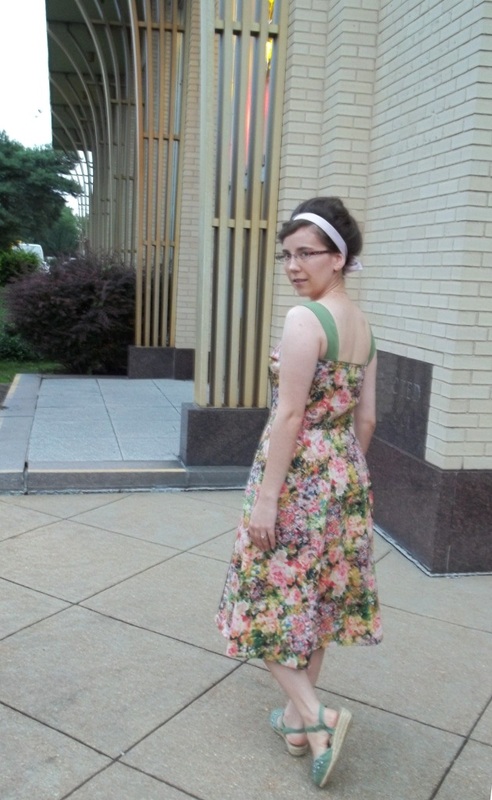 The straps are a poly/cotton linen-look fabric, leftover from making my 1931 day dress (see post for that here). NOTIONS: I only bought a pack of piping. The zipper, thread, bias tape, and a hook-and-eye (for the top zipper closure) were all on hand already. TIME TO COMPLETE: The dress was finished on July 8, 2015, after maybe 15 to 20 hours from start to finish. 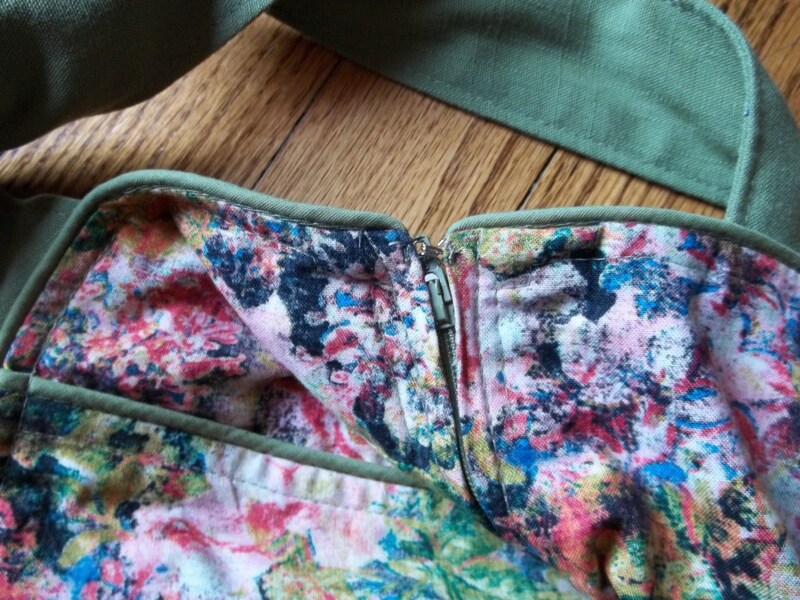 THE INSIDES: Inside, almost every exposed seam is a French seam – just how I like them! Seams that aren’t French are the hems, the neckline (because it’s covered by facing), and the long vertical seam with the piping, which is covered with bias tape. TOTAL COST: My total for the fabric on sale and one pack of piping is about $15 to $20. I love the way the floral print could be uber-feminine to the point of being overwhelming, but this is prevented and softened by being blurred slightly and muted in colors, especially with the contrast dusty olive green of the straps and piping. This is fabric caught my eye as a very close similarity to the dress of the left model on the pattern envelope cover drawing. So, I went along with sewing my look-alike and also picked the same contrast, happy to have an opportunity to use up scraps from my “leftovers” stash. When I use scraps from one project and incorporate them into other projects, I feel like I’m intertwining all my creations, giving them a subtle ‘common ground’. Most of the time, I shy away from copying envelope front model pictures or drawings, after seeing how modern patterns have the worst cover examples of any patterns. However, the vintage pattern’s drawing cover can be so cute and appealing, and I get so tickled when I am able to find a modern look-alike fabric for a vintage one. So, I guess I’m guilty of a lapse in creativity by being a ‘cover copy-cat’, but at least I know then that it’s a true vintage design. 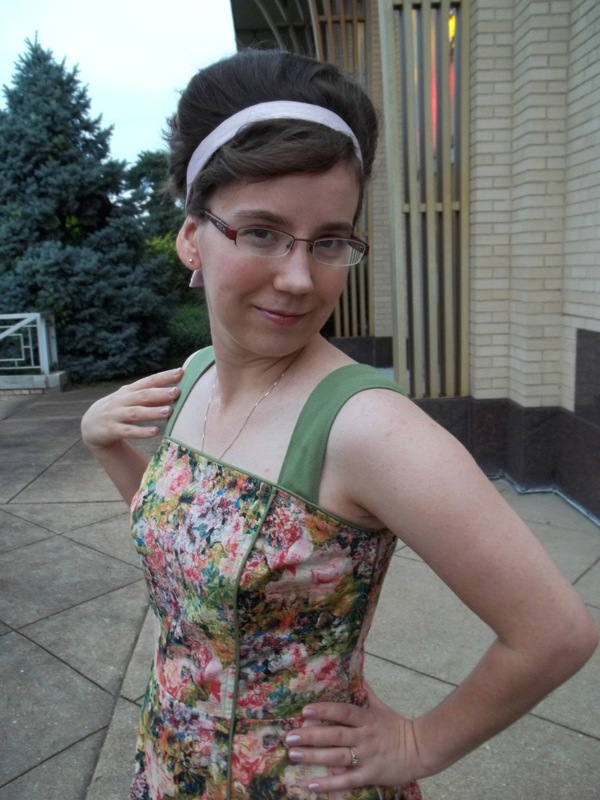 There are two bodice options to this pattern – a regular “on the fold” cut bodice, in cut one piece with darts, or an asymmetrical, mock-wrap, princess-seamed bodice, cut in two parts. I chose the two part bodice as it is more unique, offered more interesting creative possibilities, and (as I correctly thought) seemed to have more amazing shaping. The construction steps were adapted and varied a bit from the instruction sheet in order to accommodate adding in the piping trim all the way down the front asymmetric side seam. I did the darts first, of course, but then I sewed the bodice pieces to the skirt pieces and left the top edge facing for last. There was a bit of forethought needed to sew the two different top pieces to the skirt sections and not be totally confused. To understand what I mean here, know that both the front and the back skirt bottom to the dress are made of three sections (six sections in total). Thus, I had to sew both the middle and the left skirt pieces together to attach to the left bodice panel, but the skinny right bodice panel was sewn to a single right panel. The back bodice is one piece, sewn to all three of the back skirt sections joined together. The piping was then sewn in with the asymmetric vertical seam connecting the entire (bodice and skirt) left/center front to the entire right front so the side seams could be stitched for a completed main dress body. Besides the construction order being changed so I could add in piping and a slight downgrade in size, nothing major was altered to the design of the dress according to the pattern. 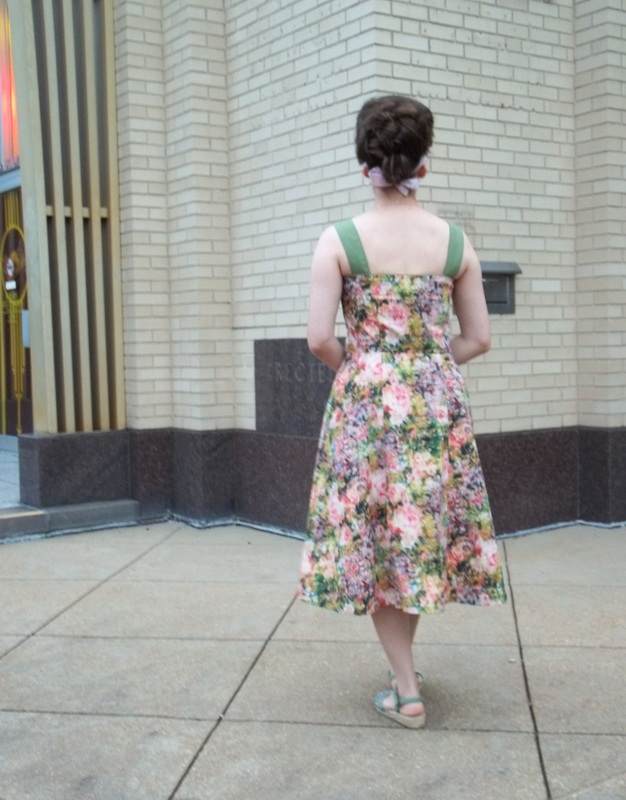 After sewing my 1944 Easter dress together, I felt very confident and excited about working with piping again, but I did improve on my method of sewing it into a seam. For this project, instead of sandwiching the piping in with the seam and sewing everything all at once (as for the Easter dress), I first sewed down the piping to one side of the fabric at the given seam allowance width. This way the piping was in sturdily place and acting like a “curb” to my final seam with other fabric laid on top. For a while, I was on the fence as to whether or not to add piping to the top bodice edge. Hubby helped me reason that it would unify the piping down the front, finish off the edge, and make the green contrast standout more. Since the piping happened to luckily be the exact color match with the fabric for my shoulder straps, I might as well use more of it! With the piping added along the bodice edge, I did not iron or sew on any interfacing to the facing. The only drawback with the piping along the top edge is the fact that the chest size is set for the dress now…it’s not forgiving. My arm and chest muscles can’t get any bigger, but for now, the dress fits, and it’s my summer standby go-to outfit this year! It was a bit a challenge when it came to adding in the side zipper, because all the curving and shaping was in the side seams, instead of in main body dress panels. This is a something I see in 50’s and 60’s patterns, whereas in most 1940’s patterns, which also often have multi-paneled skirts to dresses, the shaping is in the panels that are part of the main body of the garment. 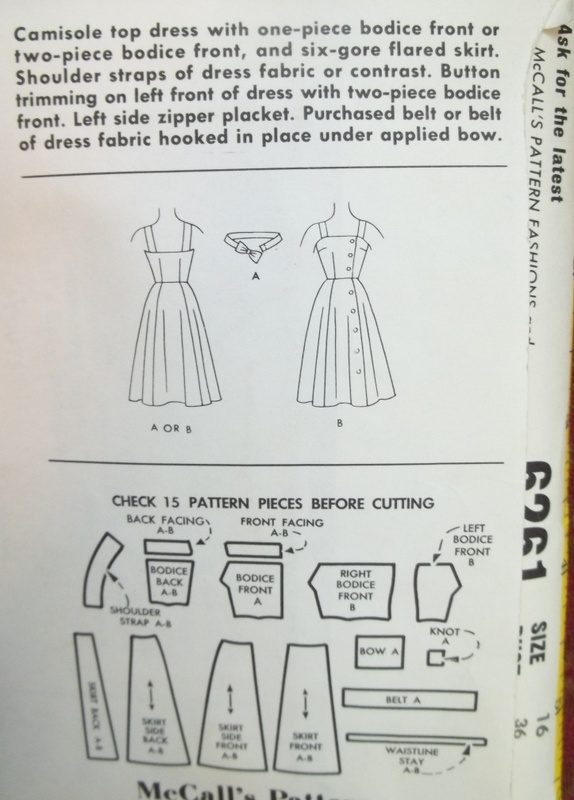 (See the patterns for my Mock-wrap ’46 dress and Winter Mint ’42 dress, for two examples for panel shaping, versus my ’50 wrap top or “Whiz-wrap” skirt, for two examples of side seam shaping.) 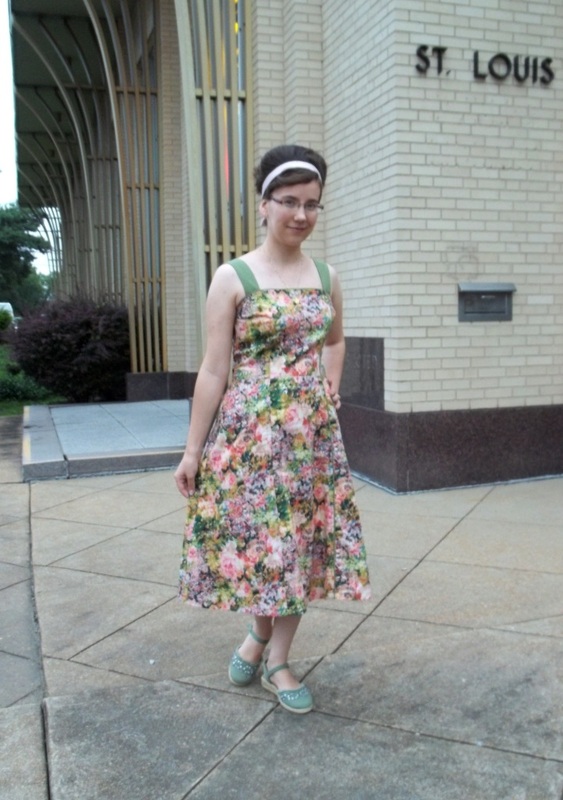 The only main body shaping to my ’62 sundress was at the bust. Speaking of seams, I loved to see how the skirt panels coordinated with the darts for the bodice. Even the straps for the shoulder are sewn on at a vertical match with the bodice darts – what irony…beautiful symmetry paired with asymmetry! Would you believe the shoulder straps are actually shaped like a half circle? Check out the pattern back. This is the ingenious way the pattern resolves design of the straps sewn so far over by the armpits. Usually with straps so far apart, they would slip off the shoulders, and that’s really not a problem on this ’62 dress since these straps deceive the eye and curve in towards the neck to stay put. Smart! I would never have guessed, nor did I think it would work myself, until actually wearing the dress as designed. Vintage patterns always have so much depth and interesting design to offer…more than what meets the eye on the envelope drawing! Near our house was the perfect setting for an era-appropriate backdrop. There is nothing as appealing to me as an architecturally interesting building, especially one as much loved, well known and local as what people of our town know as the old Buder Branch Library building. (See the B.E.L.T blog page for a handful of links about this building.) For many years it has been home to The Record Exchange store, which sells used vinyl records, cassettes, movies, and audio/visual equipment, so the whole retro-flashback feel is still alive in this amazing building. It was built in 1961, the year before the date of my dress, and I am always in awe of the graceful, standout Mid-Century Modern style of this building. Just like a well-made garment, the old Buder Branch Building is picturesque and beautiful from any and every angle it’s seen from. 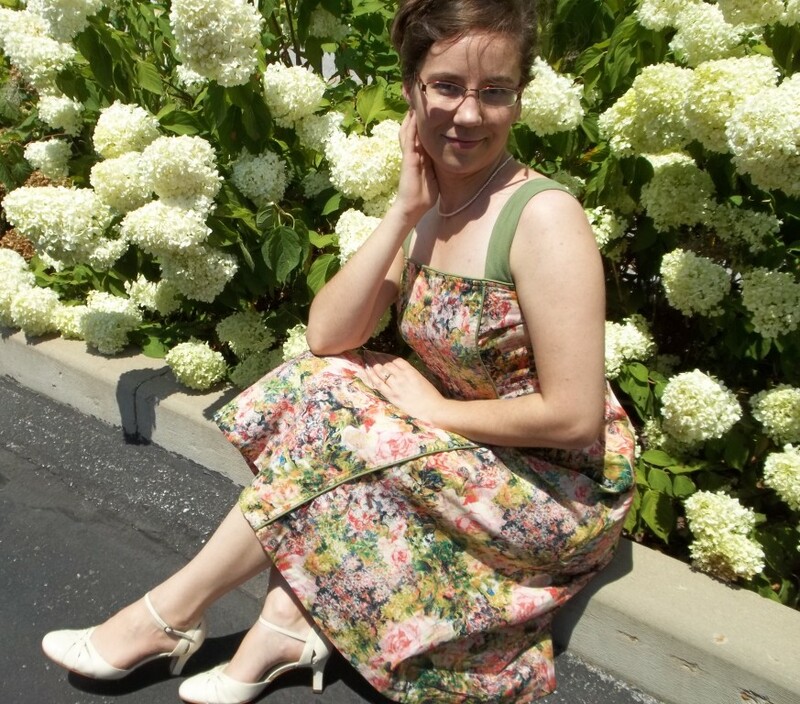 In all, what you see in this post is my perfect warm weather fix…the 60’s era, a sundress, comfy cotton, complimentary shaping, and flowers – everything I love about summer! 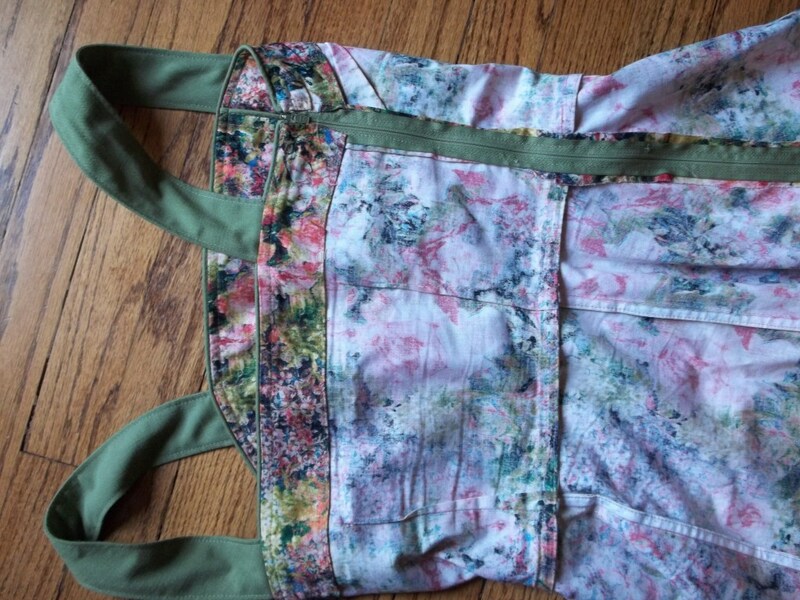 What can you sew to make your favorite season instantly better than ever? Me in front of my favorite summer blossom, the “snowball” bush.